Gergé timepieces feature a clean, bold design that is at once classic and timeless. Inspired by the bold lines of contemporary architecture, they are energized by the power and intensity of a high-performance automobile, and combine the spirit of modernity with the craftsmanship of Switzerland. They capture the enthusiasm, vitality and passion of the urban environment -- the soul of the modern metropolis. Every Gergé watch is built to exacting Swiss standards of quality by skilled craftsmen in Neuchatel, Switzerland—the famed center of watchmaking for hundreds of years. Here Gergé’s design team partners with its master watchmakers to conceive and craft expertly tuned machines, geared for precision and reliability. Inside each Gergé timepiece is a handcrafted mechanical movement. Comprised of hundreds of tiny individual parts, each movement is in fact, a high-performance engine, designed to deliver consistent and accurate time measurement. 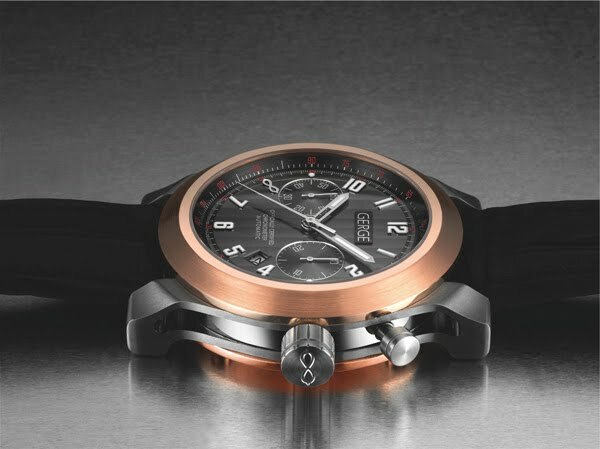 Options include a standard automatic with date, an automatic chronograph and a unique chronometer-certified, automatic mono-pusher chronograph. Visible beneath a sapphire crystal treated with an anti-reflective coating, the dial of each Gergé timepiece is an exercise in order and simplicity. Timing indicators are clearly identified and design accents are applied with sophistication and restraint. Encased in the finest materials available—high-performance stainless steel, Grade 5 titanium and 18k rose gold—Gergé timepieces exude strength and purity. Straps made from alligator and fine-grade leather are sewn by hand and paired with corresponding buckles. The Type-M Series is the premiere collection from Gergé. Created for the watch enthusiast who demands technical precision and distinctive styling, it includes three classic editions—the Type-M1, ETA 7750 base with an automatic movement, the Type-M2, ETA 7750 Elabore with an automatic chronograph and the Type-M3, Concepto 2021 with a specialized chronometer-certified automatic mono-pusher chronograph. The case of the Type-M Series conveys an architectural feel, accentuated by the unique lug construction that was inspired by the design of the world’s greatest suspension bridges. Finishes include titanium, steel and rose gold. Dials feature Gergé’s distinctive, elegant Cote de Genéve finish, combined with clean, easyto- read Arabic numbers, sub-dials and indicators. Diamond variations are also available. Production of the Type-M1 is limited to 288 pieces, the Type-M2 to 188 pieces, while the Type-M3 is limited to only 88 pieces.